I have been learning and using English since 1992. I learnt it at school for ten years and then I got my BA from Faculty of Arts, English Department, Language and Translation Section, Alexandria University. After that I received a two-month intensive TOT training. The training's focus was teaching phonetics and soft skills. Four years later, I received another training and got promoted to be a phonetics and soft skills master trainer. I have been teaching and training since 2007. 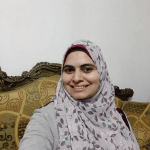 I currently work as an online English and Arabic teacher. A part-time English and soft skills master trainer at ITI (EDUEgypt project) (April 2012- September 2014 ) - The job description included interviewing and assessing candidates applying to work as ُEnglish and soft skills trainers, designing content material for English and soft skills modules, training new candidates, and supervising the training process in universities.